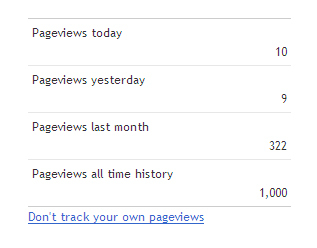 Oasis in a Gastronomic Wasteland: OGW- After 1,000 Pageviews We're Still Going Stong! OGW- After 1,000 Pageviews We're Still Going Stong! I just want to say thank you to the site's loyal readers and all 6 of its devoted followers. Today we hit the big 1,000! As a special reward, we will provide everyone who visits this site with 100 bonus points. These points may be used to redeem things like air to breathe or a good night's sleep (sorry I'm still doing this for free, so the merchandising/ advertising budget is exactly $0.00).